Brunch is beyond a tradition in Tel Aviv -- it's a culture. 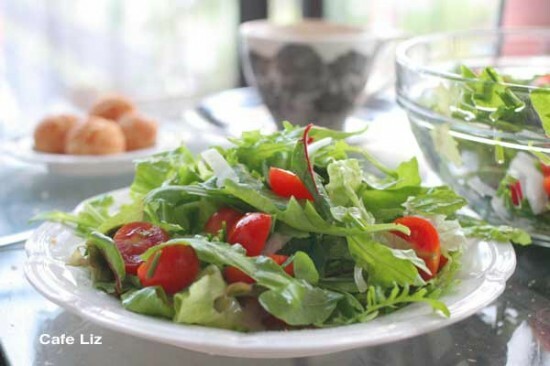 Every self-respecting restaurant offers a breakfast menu, which invariably includes "Israeli breakfast" -- generally speaking, some form of eggs, a leafy or chopped vegetable salad, assorted white cheeses, a few other spreads, some bread, coffee and/or fresh juice. The main variation is in the creativity of the spreads, the quality of the ingredients and the price. Just how much is this a tradition? 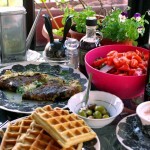 Everyone likes going out for breakfast, often in the early afternoon, but who prepares this at home? Well, we do, every weekend. We have our own private brunch on our patio. I've been refining the menu over time and picking up ideas from the myriad and sundry cafes in town. 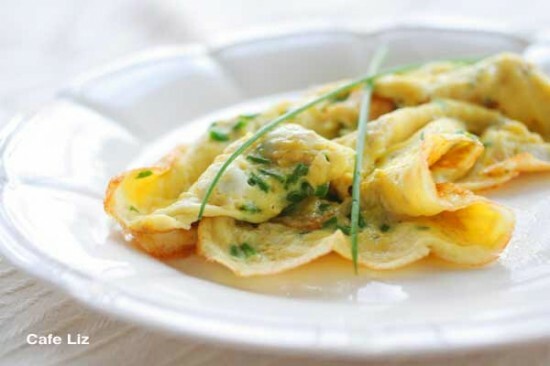 My latest love is an omelet inspired by Cafe Lou. This omelet contains cassis-flavored mustard and Sainte Maure cheese, and the first time I had it, I wasn't sure what to make of it. To tell you the truth, I wasn't even sure I liked it. But that omelet stayed in my thoughts (and tastebuds) after I left the cafe, and several days later, I found myself having a strange craving for a mustard-stinky cheese omelet. So I made one, with Roquefort and Dijon, and chives, because I like chives. The taste is quite strong, and quite surprising if you're not expecting mustard and sharp cheese in an omelet. But it grows on you. Do you really want a step-by-step explanation of how to make an omelet? You know the idea, mix everything together, breaking apart the cheese lumps, and pour it into your buttered/olive oiled pan on a medium flame. I like my eggs best when there's just a little bit of liquid left. Every item needs its own attractive little dish -- remember, when it comes to Tel Aviv brunches, presentation is just as important as taste. For me, what's most important is well-made dishes from high-quality ingredients presented in a pleasant environment. 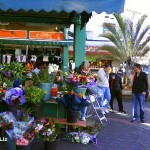 All these places fit the bill, and offer their breakfasts for a decent price, meaning in the 40-50 shekel range. Eitan was nice enough to make a Google map for them. No 100-shekel breakfasts made the list -- they generally justify the cost by including meat and alcohol, two things I don't want quite that early. 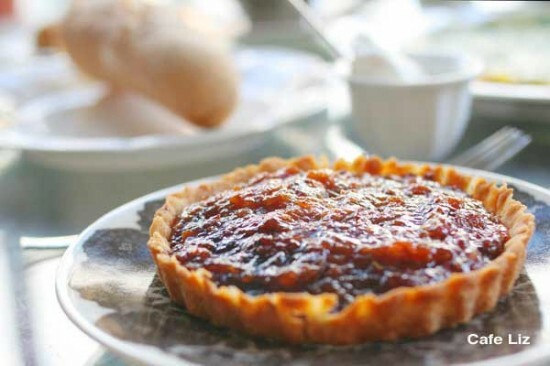 CAFE LOU -- The breakfasts come with a two-tiered platter of itty-bitty, gorgeously prepared pastries. In case it wasn't clear from that last sentence, they're amazing. I like getting the French breakfast, which comes with a large amount of cheese. Consider sharing it with someone. Served all day. Kosher-style, but no kashrut certificate. 18 Balfour Street, (03) 620-7277. UPDATE: Cafe Lou reopened under new ownership, and is now called Balfour 18. Same great menu, though instead of pastries, we got excellent breads with our breakfast. BRASSERIE (in the top photo) -- The best thing about brunch here is that many of the dishes come with a basket of freshly baked bread and muffins. The scrambled egg with herbs is excellent, but the breads are really the main reason I eat here. Plus, you can ask for a large coffee, for no extra cost, and it comes served in a bowl. Really. Served until noon during the week, and later (and more expensive) on Fridays and Saturdays. 70 Ibn Gvirol Street, (03) 696-7111. MAZZARINE -- This is one excellent bakery, with beautiful decor. When it comes to breakfast, I particularly like their whole wheat croissants. Served until noon during the week, and until closing on Fridays. Kosher. 43 Montefiore Street, and 17 Gordon Street; (03) 566-7020 or (03) 522-1050. 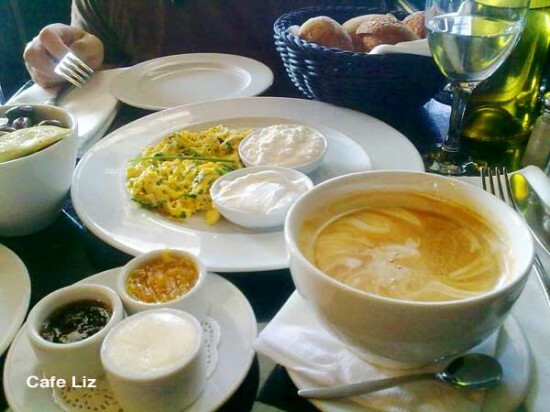 CAFE ARLOZOROV -- Breakfasts include your standard Israeli offering, with a great mix of spreads that include olive tapenade and roasted peppers, as well as red and green (mangold) shakshuka. Served until 12:30. 52 Arlozorov Street, (03) 523-5522. LOVEAT -- A fairly standard Israeli breakfast, but all in all a good place for standard food with a healthy twist. Served all day. 1 Barzilay Street, 3 Nahlat Binyamin Street, and 232 Dizengoff Street; (03) 566-6699, (03) 516-4412 or (03) 544-6470. Last but not least, I'm submitting this post to Meeta for her brunch Monthly Mingle. 11 Responses to "Israeli breakfast — the best of brunch in Tel Aviv, and a mustard-blue cheese omelet"
Thanks! I love Israeli breakfasts.. 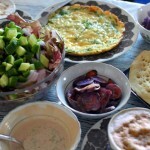 This Israeli breakfast sounds delish!! Love the idea of the stinky, strong cheese with eggs and mustard. Amazing how so few clean ingredients can make such a complex, satisfying meal. Might try this for dinner tonight!! Wish I lived closer to Cafe Lou! WOW! I am totally blown away by this! I had to tweet it on twitter – hope you don’t mind. So glad you are bringing these delicacies to the mingle – it’s going to be fun! Thanks Meeta! Of course I don’t mind you spreading it on Twitter. Thanks for hosting! Breakfast at Idelson 10 is great. Good value meal! I love blue cheese but have never tried putting it in an omelet. What a great idea! Aviv — you know, I’ve never had lunch at Idelson 10. I usually go to the branch on Kikar Rabin/Sderot Chen, and they don’t serve it there. I’m sure it’s good, though. Thanks, Ora, Joanne and Marla!